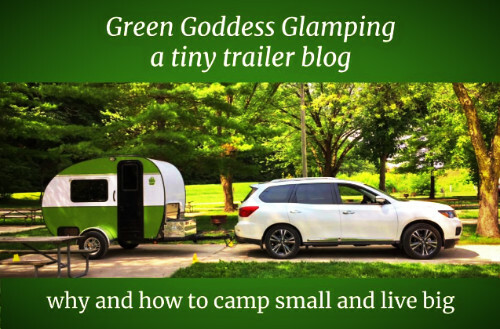 About 30 state, county, and city campgrounds are within 50 miles of my home in southeast Iowa, so I plan to do as many bike overnighters as I can this camping season. I was looking at lighter gear and ran across the SOL Escape Bivvy. It SE Iowa in the summer, not much sleep gear is needed because the nights are hot and muggy. I thought maybe I'd take a light flannel travel blanket, one of those that roll up into a little pack, and the SOL bivvy. I could pull the bivvy over me toward morning when it cooled. What are the limit for low temperatures, though? I'd watched the YouTube videos, I'd just seam-sealed a little tent I'd bought, so why not try out both? Yesterday, April 24, the forecast was possible rain and thunderstorms with a low of about 45F. I set the tent up outside the house and got in about 9 PM, the temp in the 50's. I set up with a Thermarest pad and a Big Agnes blow-up for support. I brought along a cheap fleece bag liner that I bought a couple of years ago for $10. Some reviews online had said a liner would "up" the bivvy's warmth. I was wearing a light cotton sock hat, thermal underwear, and insulated socks. Soon I inserted the fleece liner, not because I was cold but because I wasn't cozy. There were some areas where I was cool, notably where my shoulders and hips stretched the bag. As the night cooled, the cool spots became cold spots. I put on a light cotton flannel shirt, then my fleece jacket, and then my cotton cargo pants. I slept, never really getting cold during the night, but definitely having cold spots. The low of the night was 46F, but with winds the "Real Feel" was down to 32F. The little tent is a single half-dome, net with a cover. I got some wind. What I feel is that I would have been better off using my down bag. I camped in mid-March on an overnighter, used my down bag, and was cozy all night until dawn when I could feel some coolness rising from the still-frozen ground. It works as a survival sleeping bag. I never got chilled. It's a lean sleeping bag. I'm 5'8", 145lbs, and I was fine but with no extra room. Add the clothes and the fleece liner, and maybe I wasn't cozy-warm, but I was certainly snug. The zipper zips halfway, so with the clothes, the liner, the bag, each bag with a zipper, it was an expedition taking a mid-night pee! The tightener for the head works great, but the bag's zipper is right at the edge of the tightened face enclosure. I padded the zipper with the fleece liner's top edge. The inside silver liner feels cold to the touch, so the fleece bag really helped, as did socks and thermal underwear. The bag's material does breathe. I didn't have any condensation except when while asleep I hunkered down some in the bag. When I woke, there was condensation right at the edge of the face opening when I had been breathing inside the bag. The specs say the bag has waterproof seams, so if my tent had leaked, I'd at least not been soggy, like I would have been in my down bag. It's raining cats and dogs right now as I write this, so I wonder how that little tent is doing! The bag does retain your heat, but it seems that where the bag is tight one feels the outside temperature more. This was not true for my contact with the sleeping mattress. That was fine. The bivvy folds and rolls into a little sack with a shape of about 5" x 6". It's light. I'm looking forward to using it in warm and hot weather, and I'll update this review when that happens. Last words? 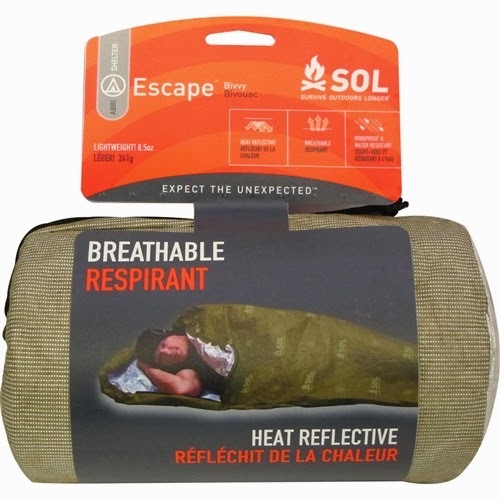 The SOL Escape Bivvy Tactical Breathable Survival Sleeping Bag is a useful addition to my bicycle camping gear, but it's one that has its limitations and quirks. By knowing the quirks and using the bivvy within its performance parameters, I believe from my night's experience that the bag will lighten my load and keep me warm. I'm not throwing away my down bag, though, and if you buy the SOL bivvy, neither should you. I'd rate this bivvy bag with three stars at this time, just an OK score because of the cold-spot experience. Once I really come to know the bivvy's limitations, though, and work within them, I think the bag will serve me well. I spent another overnight in the front yard with the SOL bivvy. This time the low was 60 degrees. The results were much more comfortable, but I want to detail the process I followed. First, going to sleep at 77 degrees, I just slept on top of my fleece liner (with only the air mattress beneath me and dressed in my light thermals as above), the bivvy bag pushed to the side. As the evening cooled I experimented: first in the fleece bag, then in the fleece bag with the bivvy on top like a blanket, then solely in the bivvy bag, then in the bivvy bag with the fleece on the outside. Finally, around 2:30 AM, I slipped into the fleece bag then the bivvy bag and slept comfortably for the rest of the night. I fall asleep easily, so this experimentation was not an ordeal. I'd just wake, adjust, and fall back to sleep. There were still cool spots, but with the warmer temps, that was not uncomfortable. Now, all the survivalist types might call me a wuss, but I wasn't looking at this bag as survival equipment; I was seeking a high comfort level. When I go bike camping overnight, I'm just looking to enjoy myself in all phases of the experience. My bottom line is I like the lightness of the bivvy, and with the fleece liner it will provide me with many options over the summer. If not for compactness and the waterproof feature, doing it all over again, I would probably look much more thoroughly at summer bags, even with the greater size and weight. However, I'm adaptable and it gets damn hot and humid here in SE Iowa in the summer, so probably in this case, less is more.